Europeans may consider August a month for a long holiday, but Chicagoans, those American workaholics, are not taking the month off. We’re busy making and consuming art. Mostly consuming. August is foreign film month for the Chicago Film Lovers Exchange. We’re discussing a film from a different country each Wednesday night. 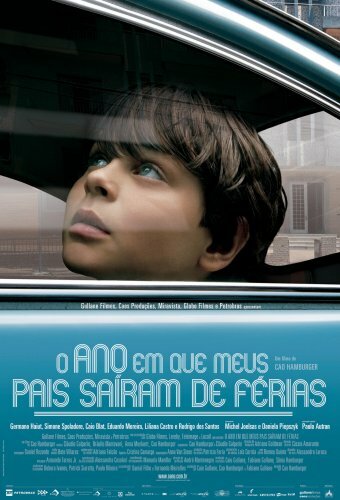 Last week we took on Brazil and member Ana led a discussion on The Year My Parents Went on Vacation, a film told from the point of view of Mauro, about the events surrounding the 1970 World Cup and political turmoil in Brazil. Mauro’s parents leave him to live with his grandfather (not knowing that the elderly man just died) because they have to flee the right-wing dictatorship that overthrew the elected left-wing government. (Familiar political story, isn’t it?) How Mauro survives and builds his own community is the crux of the film. Ana recommended another interesting film also told from a child’s viewpoint. Valentin is an 8-year-old boy whose parents have scattered and left him to live with his grandmother in 1967 Buenos Aires. Valentin is determined to be an astronaut and walks around in heavy boots to prepare for zero gravity. He knows there are problems in his family and decides he’ll solve them himself, since the grownups have failed him. Both films are charming and troubling. Troubling because both Mauro and Valentin are deserted by their parents. This week the group discussed Blowup, the landmark 1966 film written and directed by Michelangelo Antonioni (his first English-language film). It’s about a successful fashion photographer in mod London, played by David Hemmings, who shoots film in an isolated park to kill time one day. When he processes the film, he sees evidence of a possible murder, and crops and blows up the negative to try to determine what happened. Vanessa Redgrave plays the woman in the park. Blowup is on many lists of best films of the decade and century and, as a character study, it benefits from multiple viewings. One of the treats of the film is a club scene where the Yardbirds are playing: Jeff Beck and Jimmy Page as young musicians. The cameras and darkroom equipment used by the photographer are fascinating and represent an evolution in the history of photographic technology. In the park scenes, he’s shooting with one of the first Nikon Fs, a 35mm single lens reflex camera that enables him to move agilely, compared to the Hasselblad medium-format camera and the 4×5 sheet-film camera he uses in his studio. The Music Box currently is showing its annual Summer Music Film Festival with great films like Purple Rain, Hard Day’s Night, Good Vibrations and Rubber Soul. The festival benefits Sound Opinions, the rock and roll talk show, and WBEZ. 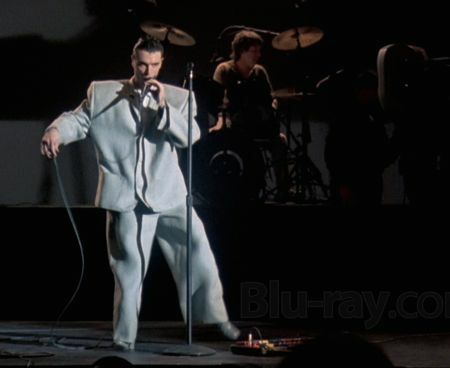 Best of all, the 30th anniversary version of Stop Making Sense, the concert film by the Talking Heads. It’s 95 minutes of magic, directed by Jonathan Demme. You can see it again Tuesday, August 19, the last night of the festival. I may go again. The film is a real treat on the big screen; I was very excited to see it that way because I’ve only seen it on a TV screen. Stop Making Sense opens with David Byrne walking out on an open stage with a boombox and a guitar. He starts off with “Psycho Killer” and near the end of it is joined by bassist Tina Weymouth. One by one, more band members join him as roadies push the drum kit stand on stage, then the keyboard stands. Chris Frantz on the drum kit, Jerry Harrison on guitar, two backup singers, Steve Scales on percussion and Alex Weir on guitar. Finally Bernie Worrell hops up on the keyboard stand and the band is complete. Musicians change off instruments throughout the concert, which was filmed over two days at a theater in Los Angeles. Demme’s touch is obvious in dramatic performer lighting and visual projections. Byrne’s creative madness is on display throughout, in his dancing, marching, duets with his bandmates, and finally, in the Big Suit. In the second half of the concert, Byrne appears in a giant suit to perform “Girlfriend Is Better.” Gradually over the next few songs, the tall skinny Byrne takes off pieces of the suit. The concert also includes one number by the Tom Tom Club, a group made up of the other band members, sans Byrne. I’ll mention one more film that gave me great pleasure recently. 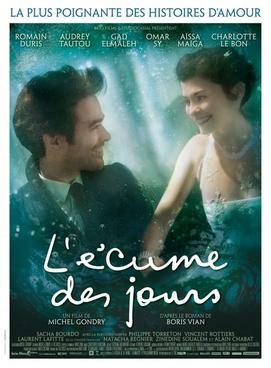 It’s Mood Indigo or L’écume des jours, written and directed by Michel Gondry (who we know for Is the Man Who Is Tall Happy?, Eternal Sunshine of the Spotless Mind and The Science of Sleep). Mood Indigo is a charming romantic film with some surrealistic features. The film bounces delightfully from one strange situation to another. Colin’s shoes run down the steps in front of him and he slips into them at the bottom. A tray of petit fours is served that actually are tiny ovens. When Colin’s sweetheart Chloe becomes ill, it’s diagnosed as caused by a water lily growing in her lung. There are some magical events and weird gadgets in this film that remind me of the crazy animation of Triplets of Belleville. Gondry is a former art student and drummer for a pop-rock band. He gained his reputation directing music videos, including five of them for the Icelandic singer, Björk. He then made many award-winning commercials for major corporations, which gained Hollywood attention and smoothed his way into film direction. Mood Indigo is adapted from a cult novel by Boris Vian. You will either love it or hate it. Consider this a save-the-date notice. If you’re a Bruce Springsteen fan, or just a fan of Americana and roots rock and acoustic music, you’ll be interested in the 65th birthday party we’re planning for Mr. Springsteen. No, he won’t be there. But Bucky Halker and friends will be there, to play Springsteen music and read some poems and doggerel. The date is Saturday, September 27, at Fitzgerald’s in Berwyn. Tickets are $10 and are on sale now. The event is being planned by the Phantom Collective, a grassroots Chicago group partly inspired by pub theater. The Phantom Collective sponsors programs of music and theater pieces—mostly from the North American and Anglo-Celtic traditions— at various venues around town. Nothing formal or regularly scheduled; that’s why it’s a phantom. Bruce is looking dang good for 64!